The Alaskan Way Viaduct is going away. In its place on and near Seattle’s central waterfront, some big ideas have been proposed. Ideas for wide expanses of concrete and sod, creating more of the same tasteful boredom that plagues many of our new or redesigned public spaces. I prefer a human-scale vision for the waterfront’s future. The People’s Waterfront Coalition offered such a vision back in 2006. But I’d add something to it. Something that builds on the waterfront assets we’ve already got. Ye Olde Curiosity Shop, Ivar’s, the Miners Landing carousel. In other words, the kitsch. Lots of people who aren’t politicians or landscape architects like kitsch. It’s fun. It adds life. It replenishes the spirit. My idea of a “people’s waterfront” would include an active entertainment area. My inspirations are pre-Trump Atlantic City, England’s Blackpool, West Seattle’s old Luna Park, and, yes, Coney Island. A big one, perhaps twice as large as the current 62/63. It would extend south to the Seattle Aquarium and north to the Bell Harbor marina. At its end would be a big, brightly lit Ferris wheel, shining out toward the bay. On its north side, as spectacular a roller coaster as can fit in the space. On its south side, smaller rides and attractions including kid-sized ones. In the center, under a colorful roof, carny and arcade games and concessions. Everywhere, laughter and shrieks and enthralled folk of all ages. It would not just replace the mourned Fun Forest but outshine it. It would all be publicly owned, but leased to private operators as a profit center for the Seattle parks system and/or the overall waterfront rebuild. You ask, but what about the rainy season? 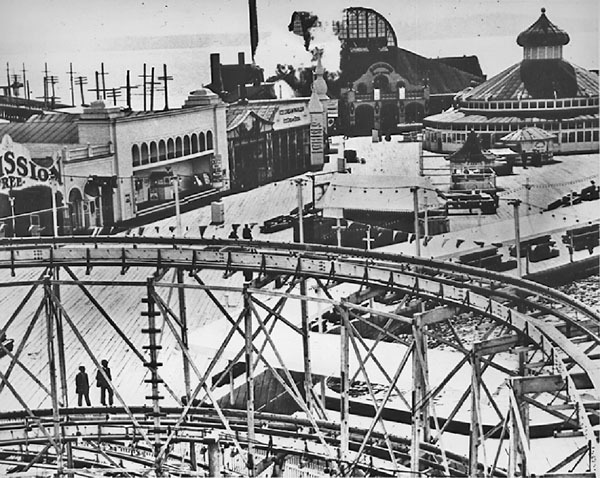 Outdoor amusement parks in New Jersey and Wisconsin operate profitably on a seasonal basis. And their winters are far more extreme than ours. Wild Waves is open weekends until Halloween. The Fun Forest’s rides opened for spring break; its indoor arcade operated year round. Our P Cubed could have a similar mix of warm-weather and all-weather activities. The P Cubed would not be upscale. It would not be laid back. It would not be world class. It would just be fun. And it would make money, and generate foot traffic to the Aquarium and the rest of the area. But mostly it would be fun. Don’t we all deserve some fun these days? Clark Humphrey is the author of Walking Seattle (Wilderness Press), Then and Now Seattle (Arcadia Publishing), and several other things. His online home is http://miscmedia.com. He was part of the early Stranger crew but will answer no questions on what Dan Savage was really like. I’m 100% pro-fun. I believe Miner’s Landing is already putting in the Ferris wheel and already has a carosel, so you just need the roller coaster. nevermind- i should read previous comments-it is REAL!! yea! They might be building this right now. Here’s a picture of what I’m seeing right next to Miner’s Landing. Of course, this could be an unrelated project – I thought the Ferris wheel was supposed to be at the end of the pier, and the construction is at the north side. Seriously, though, aren’t all the examples of kitch waterfronts–Atlantic City, Blackpool, Coney Island–dead or dying because no one ever wanted to visit them? Nope – Coney was always overflowing with people whenever I visited, back when I lived in Brooklyn a couple years ago.